Recorded at London?s legendary Olympic Studios during the heady days of the ?Summer of Love,? in a landscape of fervent creativity ? Pet Sounds, Sgt. Pepper, Hendrix, the Velvet Underground, and the Who ? Satanic Majesties stands out as a dramatic landmark. The band?s first full venture into the world of ?psychedelia,? it may have split critical opinion at the time, but is long overdue for reassessment ? an innovative and experimental piece, as much influenced by Coltrane, John Barry?s spy thriller scores, and classical composers as the blues and R&B of previous releases. Produced by the band, engineered by Glyn Johns, and with string arrangements by John Paul Jones, it features some of their most imaginative soundscapes, which included African rhythms, mellotrons, ?found voices,? and full orchestration. Amongst the song highlights are the beautiful She?s A Rainbow, with its elegant harmonies, piano intro, and strings, the powerful, riff-driven Citadel, and the imposingly dark, cosmic rocker 2000 Light Years From Home, with its sinister keyboard effects (courtesy of Brian). It also features Bill Wyman?s debut writing and singing credit on a Stones release ? In Another Land. The pioneering packaging ? a ?lenticular? 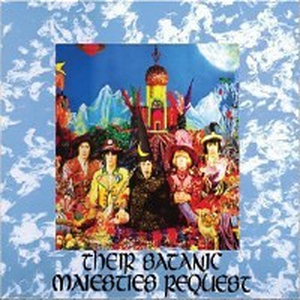 sleeve with a 3D-style Michael Cooper image of the band- and the album?s title (a mocking adaptation of the wording, ?Her Britannic Majesty Requests and Requires?? on British passports), both confirmed the group?s creative intent and also its satirical attitude.